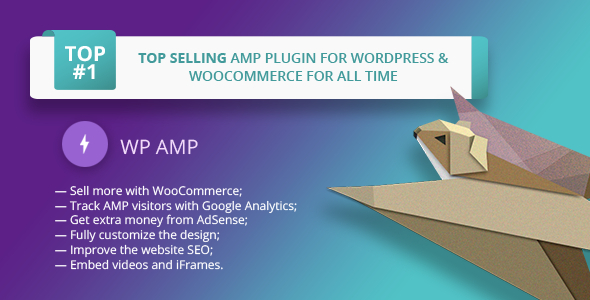 Please note: due to AMP Project restrictions there is no way to have the checkout and account pages in the AMP version. So your users will be redirected to the normal version of your site when they click ‘checkout’ etc. This feature was requested many times by users of different wysiwyg page builders, breadcrumbs. Technically there is no way to provide full support of them due to AMP standard restrictions — some html tags, inline css and custom js are not allowed. And these wysiwyg page builders for WordPress produce a lot of html and inline css that cannot be displayed correctly and validated on AMP pages. New: adding products to the cart without page reloading. Fixed: hot fix, syntax error. Improved: add image for shortcode recent-posts and related-posts. Fixed: new design & woocommerce compatibility. New: Contact Form 7 compatibility. Fixed: opengraph url for yoast and aisop. New: compatibility with Polylang plugin. New: updates via the admin panel. Improved: Added new blocks to Templates settings. Improved: Default settings, pages activated. Fixed: Compatibility with WP Rocket. - Fixed the space bug on the search. - Added ability to override content individually for every post/page.